Calgary Coupon Momma: Need More Shopper's Optimum Points? 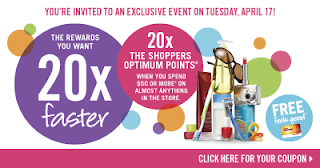 For all of you who missed out on yesterdays 20x the points event at Shoppers Drug Mart, never fear, another one is near! They are offering another one this Tuesday! Simply print the coupon from this link and shop til you drop! Also, a big thank you to Amanda G. for your support yesterday---thanks bestie! And, thank you to Heather S. for keeping me going yesterday-hugs! And thank you to Rochelle---really appreciate it! Happy clipping and saving! Feel free to post pics on the Calgary Coupon Momma Facebook page--I love to see all of your shopping trips and savings!